It's been on my "To Dine" list since it opened (It finally made its way onto my 2011 New Year's Resolution list), and it's been a bone of contention between "R" and I on a frequent basis. Yup, I'm talking about Eric Williams' Happy Dog. Ode to the glorious hot dog. You see, it wasn't that I didn't want to try it. I mean, come on, if you've ever dined at Momocho then you know that Williams is a master in the kitchen and this will probably be a pretty darn good dog. But hot dogs, like Chinese food for me, I need to be "in the mood" for. That mood usually strikes when I'm at a ballpark, cooking over a bonfire, or grilling out (Is it summer yet?!). But in the spirit of completing my 2011 Resolution, a couple of us headed there the other night in search of a good hot dog. I decided to play it safe and try one of their "suggestive wieners", because the hot dog toppings list includes over 50 options. Very overwhelming for a first-time diner. With my tots and selecting dipping sauces for them, I took a little more liberty. So my hot dog selection included: cucumber, caramelized onions, warm pineapple-ginger-currant chutney, sriracha hot chile sauce, smoked gouda cheese, and a fried egg. Viola! You know what? It was a pretty darn good dog. I won't say that it blew me away, but I can't imagine that ANY hot dog could do that for me. The combo that they had suggested had great contrast in texture and flavor, balancing cool and fresh with sweet and spicy. Although I may have enjoyed the crispy, crunchy tots and the large assortment of dipping sauces at our table a little bit more than the dog. It brought back so many school cafeteria memories! The atmosphere is laid back with quite the "hipster" vibe and a great bar area, easily somewhere that you can settle in for some dogs and beers. We'll be back, and maybe this time I'll actually bring "R" and try to create a hot dog combo on my own! I hear that the chunky peanut butter is worth the risk. Win Tickets to the International Beer Fest! 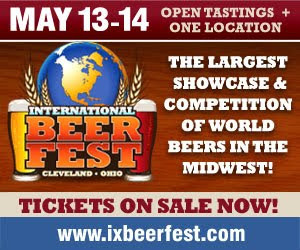 I don't get to write about beer-related events too often, but there is a (BIG) fantastic one coming to Cleveland May 13th-14th. It's the International Beer Fest! Held at the IX Center, the event will host approximately 800 beers from 200 different breweries. Umm, wow...that's a lot of beer. Personal favorites include Bell's Brewing Company and Ithaca Beer Co., and I know that "R" is thrilled to see Left Hand Brewing Co. and their tasty Milk Stout on the list. But with a list like that, there is something for everyone. 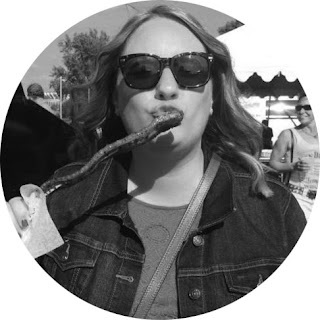 The event features tastings, celebrity appearances, educational programming, exhibitors and vendors, and a Tasting Room where you can sample food and beer and learn about pairings. It really sounds like a lot will be going on. So, have I wet your whistle yet? Good, because one lucky winner has a chance to attend! The event organizers offered me a media pass to help promote the event and provide event coverage, but they also gave me two general admission tickets to give away on my blog. Here's what you have to do to win...Simply leave a comment below telling me which beer I should try at the event. You can see what breweries and their products will be there by clicking on the link above. I am more of a wine girl, so I always look for help when selecting brews. Keep in mind that I like them fresh, on the lighter side, and not too hoppy...but I want to hear what YOUR favorite is. I will pull a winner using random.com on Tuesday, May 3rd. Make sure to leave contact information in your comment below so that it's easy for us to connect when you win. Good luck! Last weekend, area food trucks gathered once again for the second installment of the C-Town Chow Down. As you well know, the first time this event took place there were some logistical issues and many complaints from attendees. I, too, had some problems with the event but wanted to give them the benefit of the doubt since it was the first one. I give them credit for a fantastic concept, and who knew that they would experience crushing crowds. We Clevelanders just love our food, especially fun food! Well, our patience and understanding paid off this time because things certainly ran smoother last Sunday. April's Chow Down did experience a lower attendance in my opinion, but the trucks also seemed better prepared. Some offered two order windows, like JiBARO, which allowed them to take orders and serve food quickly and efficiently. We arrived early again (10:45 a.m.), but when we were finally leaving the area around 1:30 p.m. the trucks were still serving and lines were manageable. It was cold and windy (again), but that didn't keep people away! I am just looking forward to the first Chow Down on a warm, sunny day. Unfortunately, we started off on a high note and the food we sampled slowly went downhill from there. First up, was a Cheesesteak from Chef Rocco Whalen's Fahrenheit truck. Last time, Rocco ran out of food so we weren't chancing it this time. I've had this sandwich at other food festivals, such as the Taste of Tremont, in the past and it never disappoints. Then, we headed to Umami Moto for a Bahn Mi with pulled pork, mayo, diakon-carrot pickle, cilantro and jalapenos on a French baguette ($6). It was a little dry, but other than that we had no complaints. The flavor was mild, but nice, and the cool vegetables added a crisp freshness to each bite. We also appreciated them (and Rocco) slicing the sandwich in half so that we could easily share. Then we moved on to JiBARO for some seafood bisque and fried plantain chips. The plantains were dry and bland, and were only saved by the dipping sauce. I was looking forward to sampling their seafood bisque after several people raved about it at the last Chow Down. However, when I went to take my first spoonful we discovered a long, dark hair. I couldn't pretend that it was mine and keep eating because the soup had been sealed when served to us. Darn! Needless to say, that went in the trash. To sum it up, the second Chow Down flowed much easier. I think the trucks were better prepared, and knew how to handle the event for the most part. A couple of new trucks even joined this time, including Pranzo Pizza and a hot dog truck. They haven't announced the May date yet, but keep your eye on their Facebook page because rumor has it that it will be a monthly occurrence. I know that we'll certainly be ready to "chow down" again after a much better experience this time around. Yikes, it has been over a week since my last post. Reason: our home computer has completely zonked out, it's on the fritz, kapooey, crashed...you get the point. I've been itching to get back to blogging, so I finally hauled my old college laptop out of storage and it will just have to do until we replace our laptop. But, ahhhhh...this feels good. I've had several dining adventures since I last left you, and I may have lost content for three that were waiting to be drafted when the computer died (still waiting to see if files can be saved), so I am certainly not short of content. But for the first post back, I just wanted to leave you with this...Cheese. Glorious Cheese. Yes, that is 14 different kinds of cheese, and they were a result of L'Albatros Brasserie's famous cheese service. Brandon is a God. He floats over to your table like out of a dream with a tray just full of more cheeses than you could imagine, and talks you through each kind as you make your selection. When he heard of our love for goat, cheddar, and bleu...he even added a few additional cheese "from the back" that he knew we would enjoy. I can't even begin to tell you all of the different cheeses that we sampled, but we thoroughly loved almost all of them so that is a testament to how well Brandon knows his sh*t...I mean, cheese. This was all that was left... Well, that and happy tastebuds and bellies. This was my first time enjoying L'Albatros' cheeses, but it certainly wasn't the last. Go forth and cheese, my friends! Two weeks ago, I had one of the most pleasurable meals that I've had in a long time. And that says a lot, because as you can see...we dine out often. My parents were coming to town to visit, and I knew that I had to come up with a restaurant that could deliver a memorable meal and once again impress my out-of-town guests. I really love bragging about how amazing our city's culinary scene is! So I racked my brain and quickly decided that my maiden trip to Chef Jeff Jarrett's Palate Restaurant & Lounge in Strongsville was going to do the trick. Palate is Jarrett's first restaurant on his own, and after just opening in late December...word is spreading already about the food, atmosphere, and price point. We had a long day spent at the Great Lakes Science Center and a late lunch at Nate's Deli, so we moved our reservation to 8:30PM on Saturday. When we arrived, the main dining room and bar area were mostly full, but the noise level was manageable thanks to strategic decor and walls sectioning off areas. It created an intimate setting that allowed us to really enjoy the company, while still feeling like we were surrounded by other restaurant patrons. The soft earth-tones and warm lighting created an atmosphere that I personally always enjoy. Now, on to the food...because there was a lot of it! We started by sharing three small plates. Mussels with Thai flavors and cilantro ($8), Crab Cake with corn flakes, candied hot peppers, and apple butter ($5 per piece), and Buttermilk Fried Chicken Livers with cheesy polenta, spiced honey, and grilled scallion salad ($7). The mussels were good, but I didn't really get any traditional Thai flavors from the dish. It was heavy on the garlic, so my garlic-hating father steered clear of this small plate, but the rest of us enjoyed them. The crab cake had a distinct crab flavor, without being "fishy", and we loved the corn flake crust- it added great texture. I had pushed for us to order the chicken livers, as they are becoming a popular menu item at Palate, and this was the dish that Jarrett served at December's Dinner in the Dark. But, I have to say that the table was underwhelmed, and I had to agree that they were much better in December. The spicy honey was lacking, which had been my favorite component of the dish, and the polenta did not have as strong of a cheese flavor this time around. All in all, the small plates were good (some temperature issues) and we were off to a nice start. I love that several of the small plate options can be ordered in "pieces" so that you can easily adjust the dish to fit the size of your party. Then it was on to the salads (and one soup). I only tried "R's" Fried Goat Cheese salad (top) with roasted beets and apples and a cranberry honey gastrique ($6) and then my Mache Pit salad (bottom) with goat cheese, pistachio, honey pomegranate, and a lemon vinaigrette ($6). While I loved my light, citrus dressing..."R" won the salad battle. The fried goat cheese was crispy and creamy, and once paired with the apples and beets...salad heaven. Called their "showpiece dish", we couldn't help but to Oooh and Ahhh over the presentation when it arrived at our table. Luckily, it was just as delicious as it was beautiful. All of the components combined created the sensation of Thanksgiving dinner. But don't look for it on the spring menu, which is arriving in about a week! And, of course, we couldn't resist dessert. Four different desserts were sampled and passed around the table, but I enjoyed my order of the Deconstructed S'more. It brought back memories of campfires and childhood cookouts. Sous Chef Lauren Stephenson knows how to please a sweet tooth! Shortly after our entree dishes were removed, Chef Jarrett had appeared to check in on us and say hello. At this point, the dining room had cleared and he was able to spend quite a bit of time with us talking about the growing pains of opening a restaurant and teasing our tastebuds with descriptions of some spring menu items. This meal will be remembered for quite a while. While all of the dishes we sampled that night were well thought out and overall flavorful, the experience kept building with each course and really ended on a high note. The entree course (all three dishes) was a "hit out of the park" in my opinion. I also have to note that our server was outstanding, and has traveled with Jarett throughout his culinary career. Hang on to her, Chef! 2.5 hours later, we left the restaurant with full bellies, a slight buzz, and happy palates. Tickets are just $55, and they include a multi-course meal with cocktail pairings. It's being held in the hallway of the Tyler Elevator Company building on Superior Avenue from 6-9PM on Wednesday, April 13th. Just click here to purchase tickets, but don't wait! As I write this post, the Chef's table is SOLD OUT and there are only 30 general admission tickets left. I actually dined at AMP150 last night with some friends. Cooley's famous Mushroom and Truffle Soup is back on the menu this season, and I made the mistake of missing it last year. Well, I wasn't letting that happen again, and I'm so glad that I didn't. This creamy soup was so light and fluffy that it felt like velvet on my tongue. The texture is hard to describe because it was really something special. Mushrooms obviously have a very earthy flavor to them, but this soup was well balanced and it didn't overwhelm. A friend dining with me that doesn't care for mushrooms even enjoyed her first taste so much that she went back for a second sample. So get over to AMP150 this season for his mushroom soup, but also don't miss the upcoming Emerging Chefs' dinner on the 13th. I hope to attend, and can't wait to see what this creative chef comes up with! During the last Cleveland Independents' gift certificate sale, "R" purchased a $25 certificate to 56 West. Known for their "build-your-own" burgers, we knew that it was a casual place that we should check out. With my parents in town last weekend, and big dining out plans at Palate on Saturday, we wanted a low-key dinner on Friday and easily narrowed it down to 56 West. We were dining kind of late, arriving at 8:30 p.m., but the dining room was still buzzing and food was coming out quickly. After a round of beers were ordered, we decided to share the HOT AND SPICY- Pickle chips tossed in a special seasoned flour, beer battered and fried, and served with red curry dipping sauce ($6) and the BREAD AND SPREAD '3-WAY' with fresh baguette served with three spreads- olive tapenade, oven dried tomato relish, and herbed goat cheese spread ($6). The pickle chips were good, but the tang of the dill pickle was a little lost in the heavy beer batter. I personally prefer Market's lighter version of this dish. The bread and spread was served as three hearty slices of bread, each topped with one of the spreads. It was a little difficult to share with four people, but somehow we made it work. All three were good, but the goat cheese was my favorite. One gooey, runny bite in and I knew that I had made a good decision. I didn't love the 56 Classic bun, but the other components were working harmoniously together so I quickly forgot. I think it was the sesame seeds that threw me. I think the test of a truly good burger is whether or not it runs down your hands, and this burger was so juicy that it certainly was! I also ordered a side of their sweet potato fries, which were served with a gaujillo pepper, brown sugar and cinnamon rub. They were seasoned well, and everyone at the table enjoyed grabbing a few. Sweet potato fries can often be soft, but these had a nice crispy outer layer. So I left happy with my meal, and already planning another BYO burger!